Sure, we all want to eat healthy, delicious food, but that's not always convenient or affordable. Cooked Chicago, an Evanston-based meal delivery company is changing all of that. Cooked Chicago was started by Chef Jona Silva in 2014 as a way to share his love of healthy food with people who may not always have the time to prepare healthy meals. Chef Silva's culinary experience is varied; his informal education started as a young dishwasher, learning behind-the-scenes kitchen experience and an appreciation for food. He then continued his informal education in Mexico, Montreal, Spain, Portugal and Morocco, before gaining a formal culinary education at the Culinary Institute of America in Hyde Park, NY where he became a certified chef in 2009. Cooked Chicago offers a variety of meals for breakfast, lunch, and dinner, as well as snacks and juices. 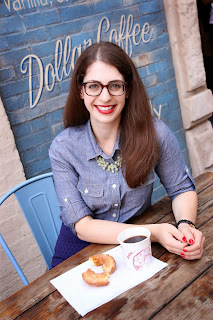 I checked it out last week and was pleased with both the variety and convenience of food options. Their website makes it easy to place your order as all items are divided into their respective categories. You can even order meal packages with three to five lunches or meals for the week, and there are options for diet types including gluten-free, vegan, dairy-free, and paleo. I found the prices to be comparable to similar meal delivery companies with larger entrees ranging between $12-$13, and salads and soups ranging from $6-$13. Personally, I always find it's a struggle to make time to prepare healthy lunches during the week, so I used Cooked Chicago to order several salads and bowls to eat for lunches. It was easy to place my order and I also was able to select the delivery date and time. You can even have same day delivery if you place your order by 10am. The best part? They came right to my door with my order! 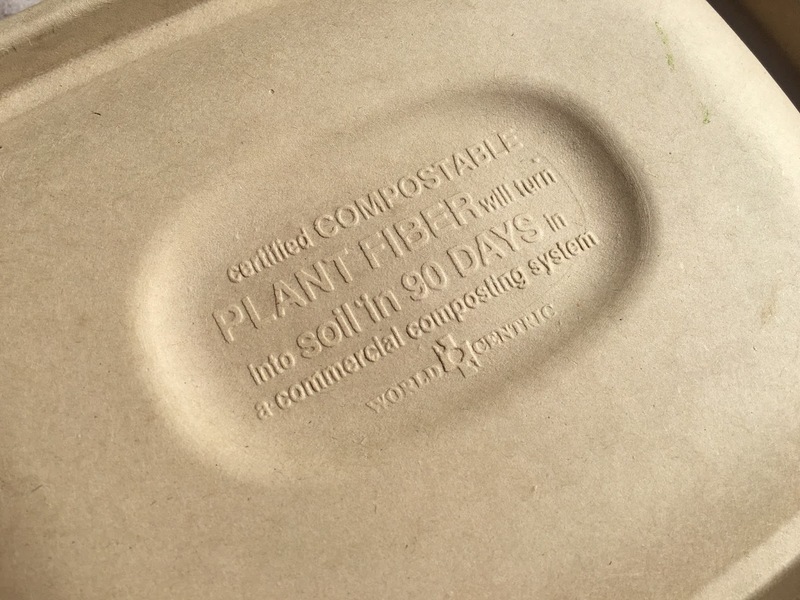 Each dish is packaged in compostable materials that also are microwave and oven safe. 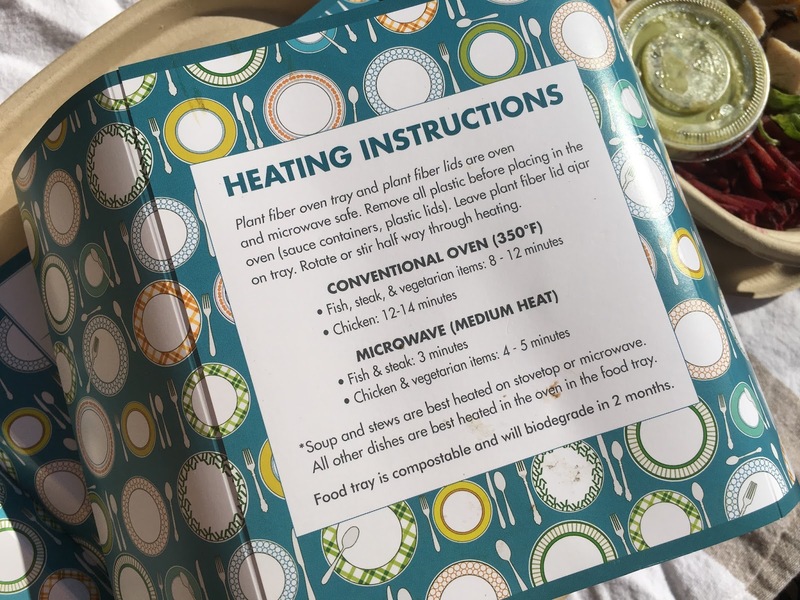 Heating directions can be found on each label, which also lists the item and its ingredients. Cooked Chicago sources its ingredients seasonally and locally, and takes pride in supporting the Chicago community and Midwest farms. I ordered three salads, one lunch bowl, and one entree to get a feel for the variety of options available. Everything was prepared nicely, with all ingredients expertly chopped and packaged. All dressings and sauces came on the side and I felt the portions were generous. The lunch kale salad with chicken had so many fresh and colorful ingredients including edamame, sweet potato, beet, avocado, and Brussels sprouts, and I loved the white miso dressing. The green papaya salad was one of my favorites because it's something I've never tried before. 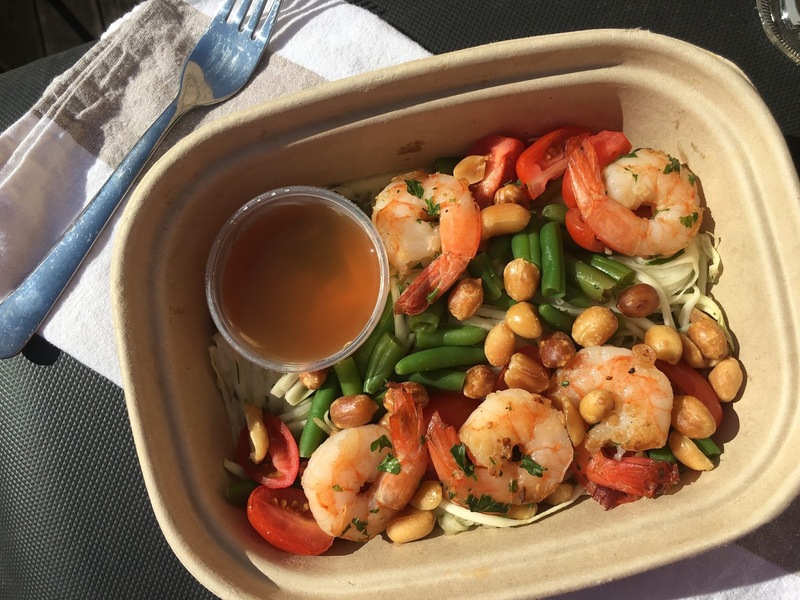 It featured ribbons of green papaya, green beans, shrimp, cilantro, tomatoes, peanuts, and a lime-Thai dressing. It was so light and fresh and I loved the crunchy green papaya. The last salad I tried was a Brussels sprouts salad with red onion, Pecorino, avocado, croutons, and an herb-garlic dressing. This was one of the most flavorful dishes, but the smallest portion. The dressing was fantastic and I even saved a little bit for one of my homemade salads later in the week. I ordered two other entrees that aren't pictured because they were so delicious I forgot to snap photos before I dug in. The butternut squash enchiladas were my favorite of the items I ordered. It was a huge portion filled with chunks of butternut squash, and topped with cheeses, avocado, and a fantastic homemade salsa. The other item I ordered was a small lunch bowl with quinoa, amaranth and millet, grilled eggplant, bok choy, mushrooms, bell pepper, sesame seeds and teriyaki sauce. It was a tasty and protein-filled option for lunch. If you're interested in checking out Cooked Chicago, use code: Atopper at checkout to get your first meal for free (up to $12)! 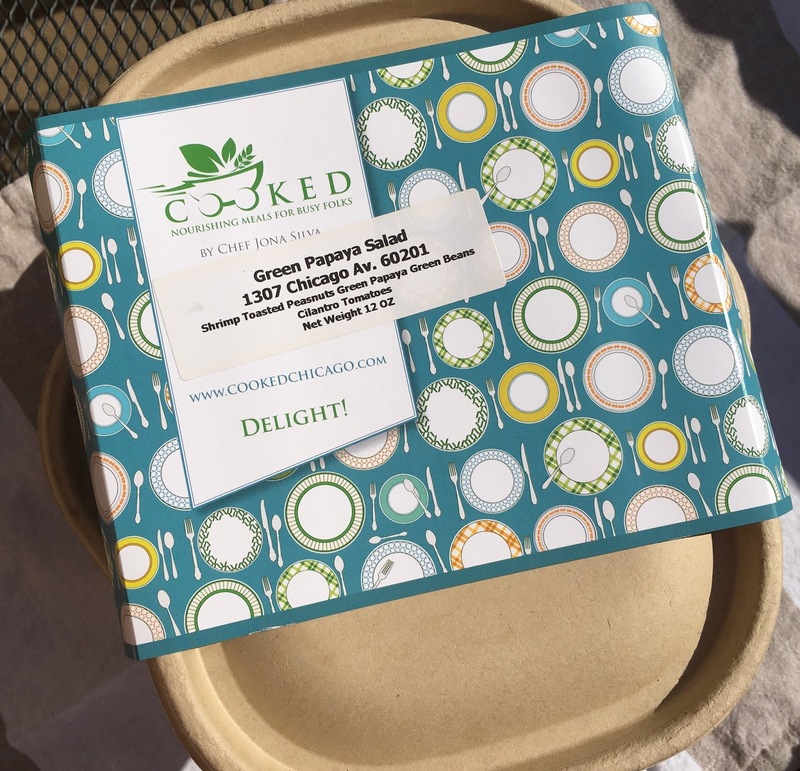 Cooked Chicago currently delivers to Chicago, the North suburbs, and the Northwest suburbs and menus change every single week! For more information visit CookedChicago.com. Note: This post is sponsored by Cooked Chicago; however, all opinions are my own.